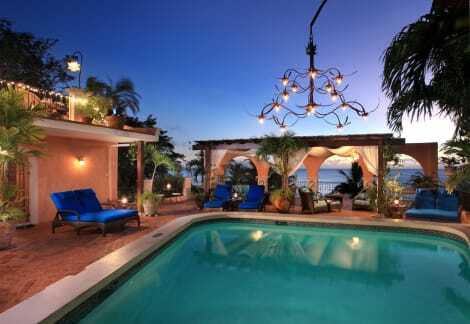 Little Arches is one of the most distinctive boutique hotels on Barbados. Nestled on a south coast hideaway bay, this intimate haven of just 10 rooms and suites is set across from the flawless white sands of Enterprise Beach. A main feature of the adults-only hotel is fusion cuisine dishes from Café Luna, its rooftop award-winning restaurant. The property is Green Globe certified and proud to support charity initiative Pack for a Purpose. Highlights: Fine Dining On Site Cafe Luna is a rooftop Mediterranean-style restaurant award-winning by Zagat Freeform, freshwater, rooftop pool with sundeck Mini-spa with signature treatments Tandem bicycles and beach cruiser bikes Barbados Golf Club par 72 championship course is nearby Recommended Rooms: The 'Luxury Ocean Suite with Pool' offers a terrace with a private plunge pool with azure ocean views Accolades: Condé Nast Traveler's 2017 Readers' Choice Award – '#11 in Top Hotels, The Caribbean and Central America' // TripAdvisor® Travelers' Choice Awards 2009, 2010, 2012, 2013, 2014, 2015 & 2018.
lastminute.com has a fantastic range of hotels in Oistins, with everything from cheap hotels to luxurious five star accommodation available. We like to live up to our last minute name so remember you can book any one of our excellent Oistins hotels up until midnight and stay the same night.